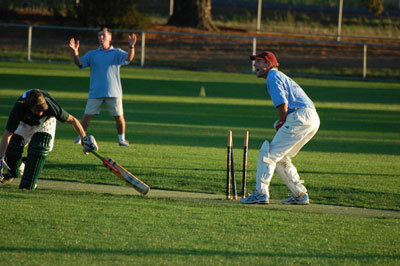 BRIGHTON Council hosted a Twenty/20 Cricket Bushfire appeal game at Pontville Park in March under lights. BRIGHTON Council has received a grant of almost $35,000 from the State Government to deliver its Active Brighton! program across the municipality. Labor MLC for Derwent, Michael Aird said Active Brighton! was addressing barriers to participation as outlined in the Brighton Council’s 2005 community survey. Some of the municipality’s young Active Brighton! 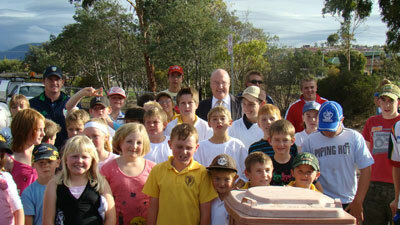 Program participants with Labor MLC for Derwent, Michael Aird. Mr Aird visited a group of young people involved an Active Brighton! program in conjunction with the Tassie Tigers Cricket team. Brighton Street Cricket was held in Seymour Street among a crowd of enthusiastic young people, including members of the Tassie Tigers team. “The Brighton area has produced some very good local and State cricketers over the years,” Mr Aird said. “Luke Butterworth, a former student of Bridgewater High School, is a fine example of that talent. A GROUP of Bridgewater High grade 9 and 10 students recently spent three days being trained to operate the sail training vessel Windeward Bound. Teacher Philip Oddie said the students had to learn a lot of new terminology very quickly and to be able to understand the instructions shouted by the first mate. 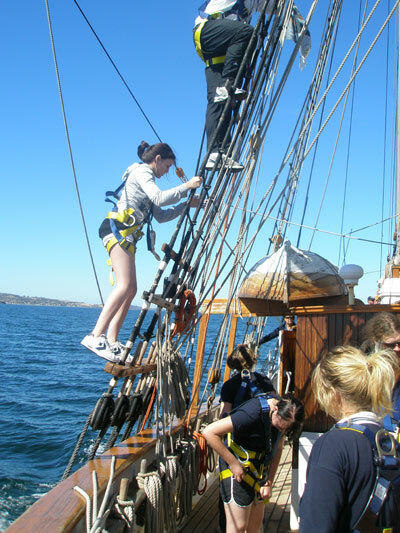 Amber Mathews climbs the rigging on the sail training vessel Windeward Bound. “They were exemplary in paying attention and cooperating,” he said. “On the first day they were trained in how to handle the square sails and yard arms to which they were attached. “Students formed one crew on the starboard side and one on the port side. THE Uniting Church Op Shop, serving Bridgewater and Gagebrook, has been extended as a result of a partnership between the church, community and the Tasmanian Community Fund (TCF). The Op Shop in Gagebrook has been serving the local community for more than 10 years and provides an outlet for affordable clothes, furniture and homewares. The extension was required to provide a new and improved display area and restore the shop’s storage and processing facilities. The new shop was opened by the Brighton Mayor Tony Foster on 23 January this year. On March 5, the Commonwealth Government approved funding of up to $4.35 million to build the Bridgewater Regional Trade Training Centre on Bridgewater High School land. This is a wonderful development that will complement our plans to build a new Grade 9 to Adult Learning Centre on the site. The centre will add great value to the education and training opportunities we provide to our community through the Bridgewater Brighton Learning Federation by improving student access to trade training facilities for secondary students undertaking trade-related pathways as well as assisting people in the community to re-enter education and training and on to work. 2009 has begun and it looks like this year will be another exciting one for our community. Brighton has much on the drawing board and the signs are positive that this year will be another year of significant achievement. One of the most exciting developments will see the transition to the new education concept announced last year by Premier and Minister for Education David Bartlett and his government in accepting the major recommendations of the Southern Midlands Education Renewal Taskforce. New manager of the Bridgewater/Brighton Learning Federation Andy Bennett is already out and about in our community and consulting with stakeholders to ensure that the transition is a smooth one. A profile on Andy and his most immediate priorities is featured in this edition of Brighton Community News. The future of education in our community remains our top priority and we will be working closely with Andy to ensure that the major initiatives of the recommendations are implemented. A TASMANIAN-developed local government management software program has been sold to the Suva City Council in Fiji, opening up a potential export market for the local technology. The PropertyWise software application, to manage local government operations such as property rating, animal control, development applications and property management, was developed by Brighton Council and is marketed by its wholly-owned company MicroWise Australia Pty Ltd. 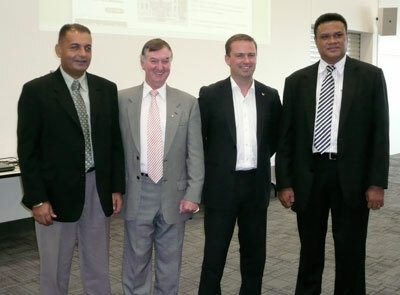 Marking the sale from left, Suva City Council’s director of engineering Jagdish Singh, Brighton Mayor Tony Foster, Premier David Bartlett and Suva City Council’s director of finance Apaitia Veiogo. The software is already used by 14 local government authorities in Australia, with 10 in Tasmania, three in Western Australia and one in New South Wales. The installation at Suva City Council represents the first international purchase and Brighton Mayor Tony Foster says it could be the forerunner of increased national and international sales.